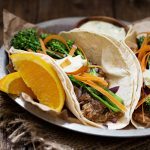 Delicious, slow cooked orange pork, served in tacos with tender-crisp broccolini, shaved carrots and diced onion. Topped with a delicious jalapeno-orange sauce. Generously season pork with salt and pepper and place in a 5- to 6-quart slow cooker. In a small bowl, mix together the red-pepper flakes, marmalade, vinegar, rosemary, and garlic. Pour over pork. Cover and cook on low until meat is pull-apart tender, about 8 hours (or cook on medium-high for 3-4 hours). For the Jalapeno Sauce: Combine all the ingredients in a food processor and process until smooth. Taste and adjust seasoning, as necessary. Remove to a bowl and refrigerate until needed. Transfer pork to a large bowl with a slotted spoon and break up ("pull") with two forks. Strain sauce through a fine sieve, discarding solids. Skim fat from surface of sauce (*If you have time, it's easier to spoon off the fat if you place it in the freezer for a bit and let it solidify.) Return sauce to the bowl with the pork. Steam or microwave the broccolini until tender-crisp. To assemble tacos: As the "sauce" for the taco is thin, spoon pork on to tortilla using a slotted spoon, so your pork is moist but so that you're not adding too much liquid to the taco. Top pork with broccolini, shaved carrot and diced red onion. Top it all with a dollop of jalapeno sauce. Serve with a garnish of orange slices and additional jalapeno sauce.